Born in Ireland, Kerr came to Canada in 1887 with his parents, where they settled in Hamilton two years later. He earned civic recognition at the 1902 Coronation Games where he won sprint and middle-distance races. His exceptionally quick start placed him in the forefront of Canadian sprinters and, in 1907, he won 40 events. 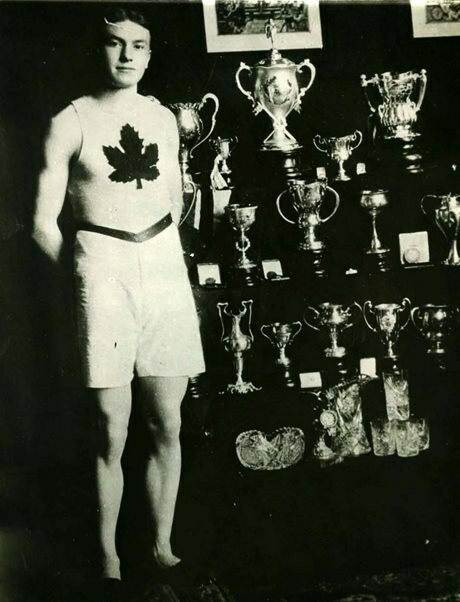 His greatest feats, however, came in 1908 when he won the 100- and 200-yard races at the British Championships and gave Canada a gold medal with a memorable victory in the 200-metre race at the Olympic Games in London, England. Kerr remained active in international competition for 25 years, serving as Captain of the Olympic track team (1928) and manager of the track and field division (1932). Visit the Ontario Heritage Trust provincial plaque in Bobby Kerr Park at the corner of Palmer Road and Reno Avenue in Hamilton, Ontario. Watch Hamilton’s Sports Hall of Fame induction video for Bobby Kerr. Learn more about Kerr on the Canada’s Sports Hall of Fame website.